The Hamiota School District was formally established in April 1892 and a school building was erected that year on the southeast corner of the farm of James Stewart in the Rural Municipality of Hamiota. 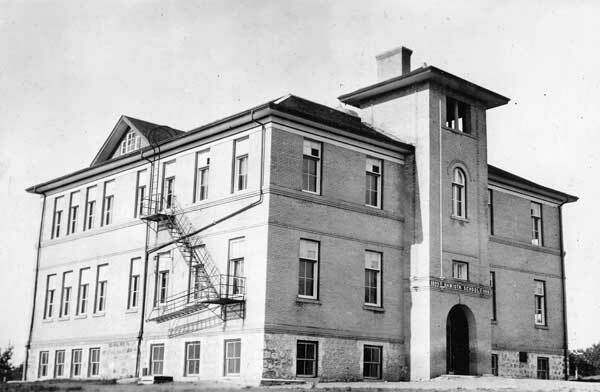 In 1899, it was replaced by a two-classroom brick structure with a basement in Hamiota. The original school building was moved into the village and used as a private residence, later occupied by Mayor E. P. Venables. In 1908, two more classrooms were added to its southeast side, on a design by Winnipeg architect S. Frank Peters. 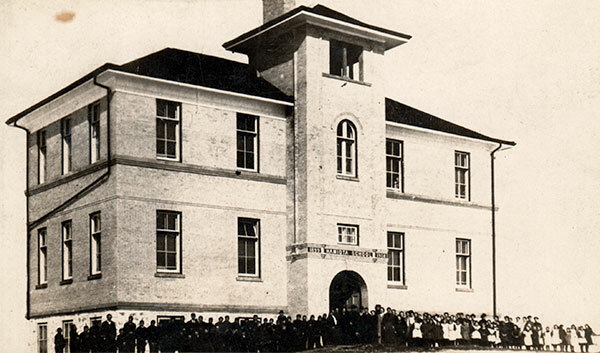 The school was one of the first in Manitoba to participate in the consolidation movement when, in June 1912, it joined to Kerr School No. 220 and Chumah School No. 401 to form Hamiota Consolidated School No. 692. A second addition to the school, on the north side, was made in 1914. By the 1950s, it had four classrooms on each of two storeys. It was demolished in 1957 and replaced by the present structure nearby. Among the other teachers of Hamiota School were Miss F. M. Cochrane (1906-1920), Lillian Lawson, Miss S. A. Sproat (1909-1920), Miss G. Houck (1918-1919), Mrs. Gladys Fraser (1926-1955), Miss A. Lavery (1941-1948, 1953-1954), Bert Reid, Ada Venables, L. Norris, A. C. Courtney, J. E. Simmon, H. A. Garland, K. M. Lewis, E. Cowan, K. Cameron, L. Ripley, J. N. McFarland, B. Coates, C. Q. Atkins, E. Graham, E. P. Latimer, V. P. McKenzie, R. Hawthorne, F. A. Lind, M. A. McConnell, M. McClumb, M. E. Andrew, M. Muldoon, L. Arnold, L. Hainstock, J. A. Rogers, A. P. Herkes, L. Spooner, M. Mair, A. L. Loundry, A. Mellar, F. Wilson, E. Hawthorne, M. E. Usher, L. Nicol, M. E. Geddes, E. M. Burkholder, B. A. Hume, R. Vasey, J. H. Woodhill, O. M. Horn, E. Steele, L. Hodges, K. Condell, T. Moloney, E. J. Mollerd, F. Turner, N. M. Molson, Weston Sweet, L. Hodges, E. E. Nelson, J. M. Howlett, I. Wilkinson, R. J. Fraser, L. A. Glinz, L. King, L. McDonald, O. M. Eby, J. M. Brown, K. Walley, D. B. Fraser, M. Lund, J. McCrindle, Russel H. Hayter, W. C. Campbell, R. Bundy, G. Pollard, A. Small, M. McCrindle, V. Howe, P. Haedisty, V. Murray, E. Brook, A. Dunn, V. Jeffrey, I. Birney, O. Smith, F. Francis, L. Kirk, N. Fraser, J. Cummings, L. Ellerington, D. Bridge, E. Jones, R. E. Rathwell, W. Bamford, E. J. Black, R. Stacey, A. C. Thompson, A. E. Lawson, Leonard H. Goldsborough, M. C. Brown, V. Jones, C. E. Morton, H. W. Savage, J. L. Hamilton, J. E. Leifer, V. A. Motherall, L. Giesbrecht, S. I. Coulter, M. Hazelwood, A. K. Butcher, H. E. Irwin, G. Scott, and Miss Mary Babuik. GR8461, A0233, C131-1, page 109. “Wanted, contracts,” Manitoba Free Press, 10 June 1908, page 2. “Hamiota, Man,” Western Canada Fire Underwriters’ Association map, 1916, Archives of Manitoba. The History of Hamiota by the Hamiota Women’s Institute, circa 1949. A History of Hamiota Village and Municipalty by Hamiota Women’s Institute, 1953. “Current comments,” Hamiota Echo, 18 April 1962, page 2. We thank Len Goldsborough and Nathan Kramer for providing additional information used here.